This chapter reviews the importance of plants to the urban environment. It summarizes the conditions to which plants are subjected in the urban environment and some of the benefits they provide both physically through cleaning air and water and psychologically. It reviews briefly the history of urban flora studies and the most common spatial sampling designs used by researchers to document urban plant species over time. While the majority of past research has focused on taxonomic cataloging of the species found in cities, with a particular emphasis on native versus non-native, current urban plant ecology research questions revolve around the novel ecosystems being created in urban areas, evolution and physiological adaptation, and the role of human attitudes. Finally, we offer an energetics-based approach to understand species presence and absence as a function of their metabolic adaptation to multiple environmental gradients encountered across a heterogeneous urban landscape. 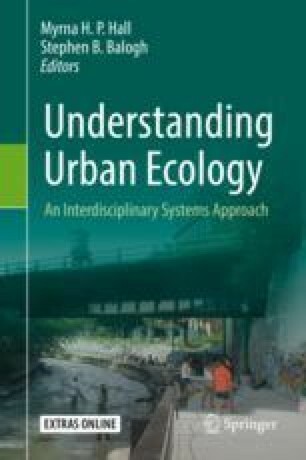 Such knowledge, we propose, can help city planners, landscape architects, and citizens preserve urban ecosystem biotic structure and function in a changing world. The online version of this chapter ( https://doi.org/10.1007/978-3-030-11259-2_11) contains supplementary material, which is available to authorized users. Thank you to Dr. Ariel Lugo, forest ecologist, and Dr. Catherine Landis, botanist, for their thoughtful, probing, and insightful reviews that helped shape and enrich this chapter.